You always knew your son was a stickler for the rules. Ever since his little brother was born, and he tried to tell him the rules of the house. He sat in front of your youngest son, and told him that when it is bed time that the baby couldn't be loud, and he has to poop in the toilet like a big boy. He is a good big brother, he just likes his rules. He likes his rules so much that he has been elected hall monitor at school. And he respects the due dates on books. He would probably even be kind, and rewind a VHS rental before returning it. (If he knew what a VHS was.) Now, he has decided what he wants to be when he grows up, and it isn't a fireman. He has decided he wants to be a referee. He wants the white, and black striped shirts. He wants to be able to throw down the yellow flag when he sees someone breaking the rules during the game. 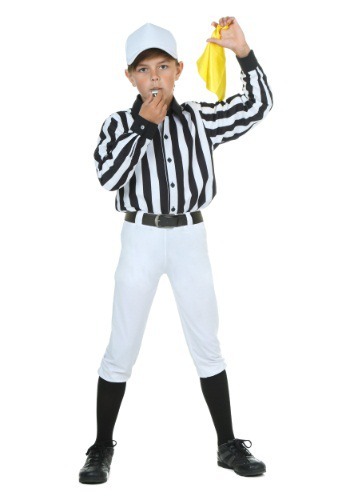 So, get him this Child Referee Costume, and just hope that it is a phase, and that when he grows up he will be a lawyer. You think being a lawyer would be the perfect job, he gets to obsess over the rules, and make lots of money. (Hopefully.) But for now let him get the referee thing out of his system. Support his goals, by purchasing a whistle to go along with the costume. Actually you might need to hide that whistle after the first couple of days of him blowing it at his brother.